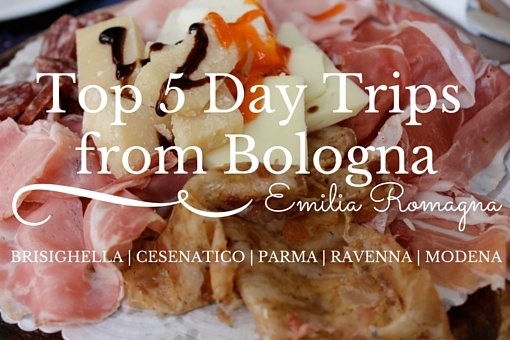 After the McDermott's trip to Bologna, I had my own lined up shortly after their departure. My 'cousin,' Melissa, living in Rome invited me to join her and her good friend Aman on their adventure in Amsterdam and since the tickets were reasonably prices, how could I refuse? Four wonderful days were spent in Amsterdam with the lovely company of Melissa and Aman. 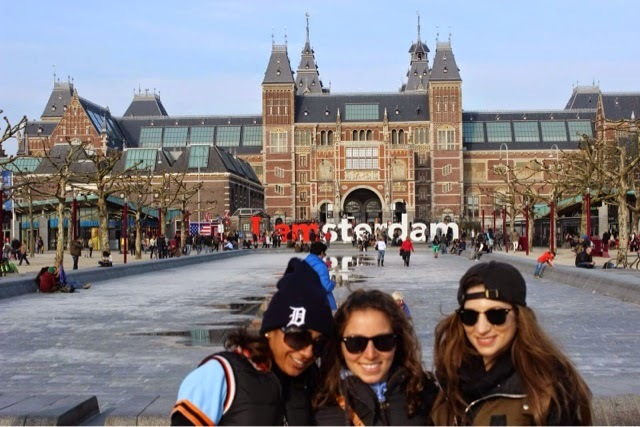 We saw all of the main sights including Anne Frank's house, the Van Gogh Museum, the Heineken Museum, and we got to go on a fabulous bike tour by We Bike Amsterdam, that became the highlight of our trip! 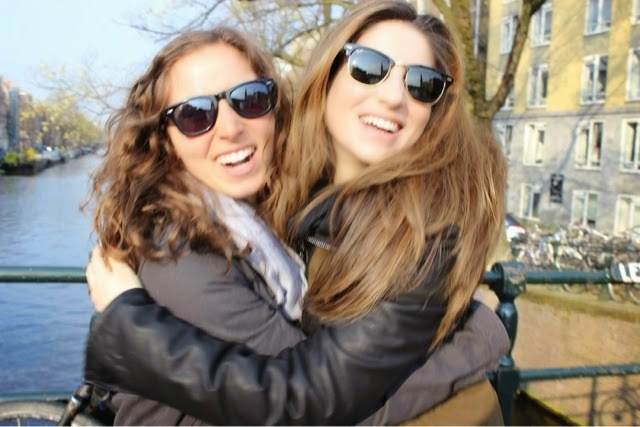 We loved Amsterdam. The city was gorgeous and clean. 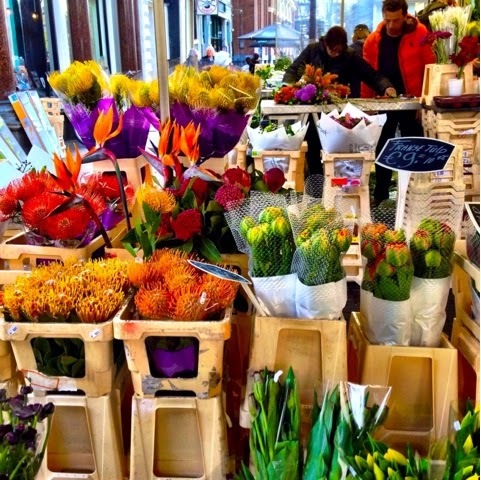 Compared to Italy, it seemed like the city was silent although it was bustling with people. I enjoyed their use of transportation, mainly bicycles, motorinis and boats. For transporting merchandise and goods, I noticed they used the Piaggio vehicle, the Ape50, because it's small and can easily roam the canals and small streets. I was excited about this because it reminded me of Italy, and a hint of Italy in Amsterdam made the experience nearly perfect. It was spectacular being in a city that was respected by its citizens. You did not see run down buildings, trash in the street or grafitti covered walls, even in some of the areas that you might have expected to find some trace of disarray, like the Red Light District. 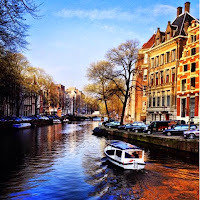 We were lucky to have four entire days in Amsterdam. 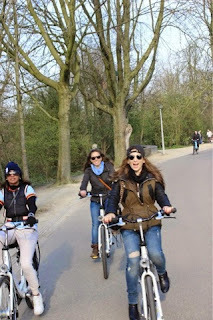 Even four days was not enough to see all the historical and cultural treasures of the city, nor did we have enough time to venture outside of the city to see the famous tulips and windmills by bicycle (next time!). We were, however, able to see some of the most beautiful pieces of art in the Van Gogh collection, I could have spent hours in there! And museum at the Anne Frank house was so moving, emotional and full of information. They did a wonderful job sharing pieces of Anne's diary and making you feel close to the kinds of hardships she and her family endured during the War. The exhibit was just amazing. Aside from the museums of Amsterdam, my favorite thing was of course, the food culture. Our We Bike Amsterdam, experience was a fantastic combination of bicycle riding the picturesque canals and getting a take on the best street food in Amsterdam from a local's point of view. On our bike tour we made four stops. 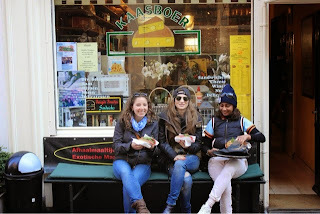 Our first stop was a small deli shop that had cheap gourmet sandwiches. 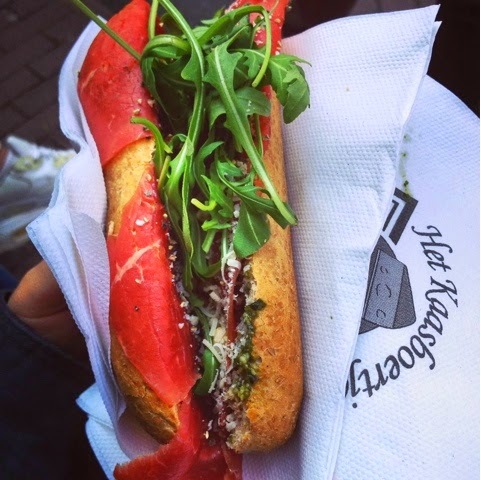 The sandwiches weren't, per-say, Dutch, but it would be on a local's radar because of the sandwich price and the variety and quality of the ingredients, and of course the woman who crafted the sandwiches! She was so nice! Our next stop was my favorite. Near the North Church of the city we stopped at a restaurant called Winkle. See... others can attest to the delicious quality of the Winkle Pie, take a look at Foodnouveau.com for a devoted Winkle fan and recipe! 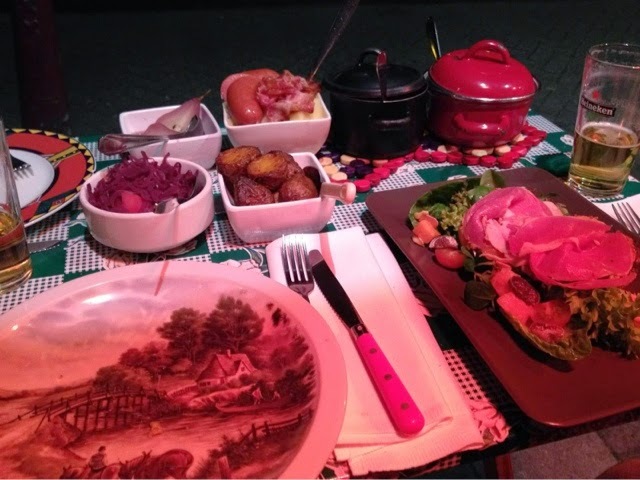 The restaurant was located on a road directly next to the piazza of a large church where they were holding an open market, and the restaurant also placed wooden benches and tables in the piazza for customers to sit at and enjoy the fresh air. Our guide picked a table shared amongst other hungry Dutch and flagged a waitress over. He examined our hunger, and then decided there would be more food to come, so he ordered himself a coffee, and then a single serving of apple pie with whip cream for us three ladies to split. He probably made the right choice in only ordering one piece of pie to share, but honest to god, this Winkle apple pie was the best apple pie I had ever tasted and I easily could’ve eaten half a pie if it was placed before me. It had crust baked to a perfect and topped with the right combination of cinnamon and sugar, the apples were baked perfectly and were divinely sweet, and the fresh whipped cream tied everything together completing each bite perfectly. 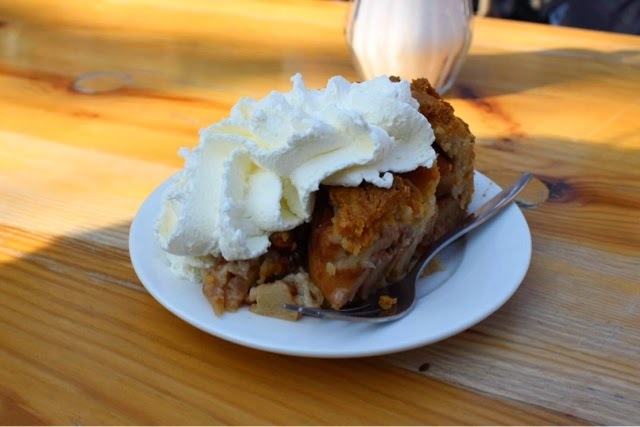 I wanted more… but we were off to the next stop on our tour as my mouth salivated over that delicious piece of pie. We unlocked our bikes (with some difficulty) then mounted and pedaled off toward the museum district. This was the longest leg of our journey and it included biking through a lovely park where we were able to disregard some of the rules of the road that were heavily enforced on the small, canal-side streets. Exiting the park we found ourselves a few blocks away from the museum district. 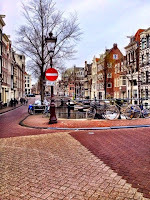 My criteria for the biking adventure was a stop at one of the iAmsterdam signs throughout the city. 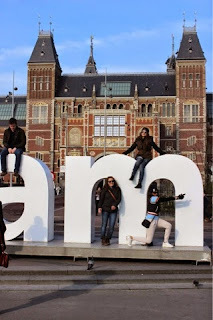 Our guide was spot-on and took us to the large park in the museum district where tourists glued to their cameras tried to capture their friends and family struggling to climb the slipper red and white letters that made up the sign. Aman and I avoided looking like a fools and perhaps an injury and instead helped Melissa climb atop the M with rather quick success. Looking back at the photos Thijs took, it is clear we weren’t as smooth as we though we were hoisting Melissa on top of the M. The pictures to follow of all of us in position came out great though! 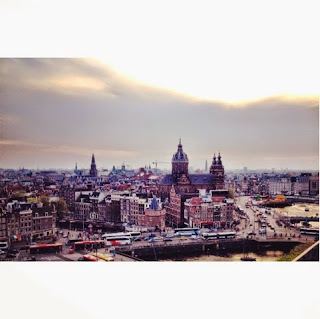 Our last leg of the adventure took us under the Rijks museum and back in towards the city. We biked straight towards a small blue hut situated on the corner of one of the many bridges cross the canals. 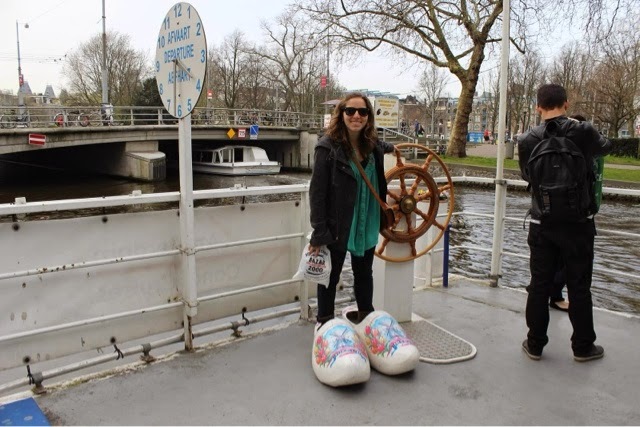 This was our last and most cultured taste of Amsterdam. 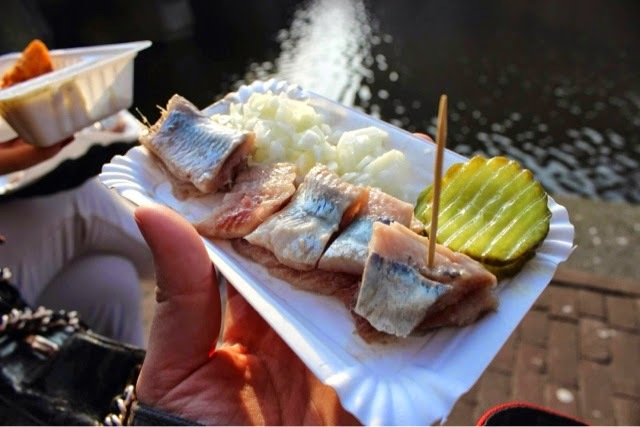 Raw herring! And surprisingly, it was delicious! We sat on a bench overlooking the canal and enjoyed our last stop on the tour. Afterwards, we cycled slowly back to our starting point, returned our bicycles and took photos with our guide. All-in-all it was a success! 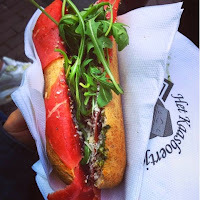 It was a very historical and food oriented view of Amsterdam, and an unlikely path to explore that we would have missed if we weren’t guided by a local. When in Amsterdam, tour by Bike! The rest of our weekend seemed like a blur packed with ethnic foods, friends, Van Gogh and Heineken. We were shocked at the high number of ethnic food shops within the immediate distance of our hotel. Aside from our first “real dutch” meal at Moeder’s our first night, our dutch food binge ended, and we explored the other delicacies, like Indonesian (from the Netherland’s early historical relationship with Indonesia), and other ethnic foods that almost have a greater prominence and prestige throughout Amsterdam. 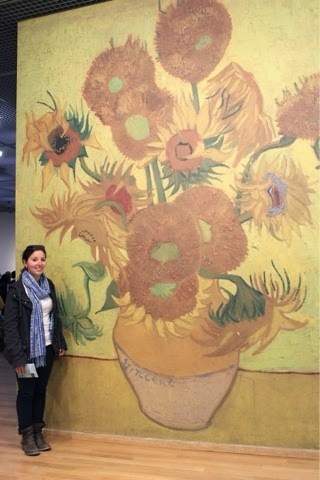 Our Van Gogh experience was fabulous, but we didn’t have enough time to just soak it in. The museum was huge. Multiple stories tall, with Van Gogh after Van Gogh splashing the wall. It was really something else. Something about visibly seeing the paint brush strokes and the size of the canvases really pulled you into the painting. They also offered a timeline of his life and details of his sickness which also put each painting into perspective making them all the more powerful. I spent a little bit longer at the Museum than Melissa and Aman, as they headed back to meet Aman’s friends for drinks at the top of a hotel near the train station. Once I finished my Van Gogh experience, I wandered back towards the station, under the tunnel of the Rijks museum and alongside the perfectly symmetric canals. 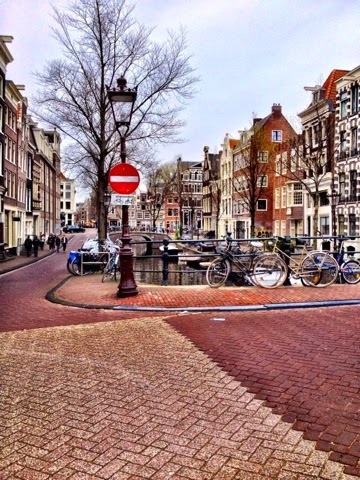 Bicycles lined every street and every bridge, and whizzed by the pedestrian and car traffic. People walked around with smiles on their faces and happiness just emanated through the air without even trying to. I walked the 40 minutes down new streets and small alley ways with a grin on my face and intrigued at all the new sights. I finally made it down to the station and walked east along the canal to find the large Sheraton hotel where Melissa and Aman were meeting friends for drinks. I took the elevator up 20 or 30 floors to the bar that spanned the majority of the top floor and had an outdoor patio. I found the group of friends chit chatting and ordered myself a glass of wine. Aman’s friends were beyond nice, friends from when Aman acted back in Rome and who then transferred to Amsterdam in search of a happier and cleaner lifestyle. It had clearly been some time since they last saw each other so there was plenty of chatter and laughs to last an evening, and enough to have her friends join us for dinner at burger joint they had recommended. We ate a delicious meaty meal on a cobblestone side street, then headed back to the hotel where I retired to bed, and Aman and Melissa went out on the town! Sunday was departure day as well as sleep in day. Melissa and Aman were leaving late that afternoon and I was staying the night and leaving in the morning, so I still had 24 hours in Amsterdam. After we got ready, we made our way passed the white canal bridge seen in many photographed Amsterdam scenes and along the canals towards the Heineken Museum. I was really looking forward to this, since I had heard great review from Tim about the Museum, and he was right! It was a fun and interactive beer museum, and we learned a lot about Heineken’s history that was actually far more interesting than I expected. It was a much better experience than that in the Guiness Museum, plus we got a free canal boat ride back to the station at the conclusion of the tour. Totally worth it. After we finished the Heineken museum and rode the canal back toward our hotel, we checked out, I said my goodbyes to Aman and Melissa as they headed towards the airport, and I went to find myself a cheap hotel to suffice for the night. I was lucky enough to find a cheap and safe hotel that was close enough to the train station for my early morning trip to the airport. Since I didn’t feel totally comfortable being out in the red light district by myself, I made sure to spend every last hour of light wandering canals I might not have seen before. I also made a point to head back over to the North church to get one last slice of the most delicious Winkle apple pie that I would take to-go. I wandered till the sun began to set, apple pie in hand, then I returned to the hotel to pack, get in my PJs, turn on the TV and enjoy my Winkle apple pie for dinner in the comfort and safety of my subpar cheap hotel room. A great end to a great four days in Amsterdam. I have no doubt that I’ll be back! Especially after having read The Goldfinch!